While your cruise ship is in St Petersburg, explore the glorious ‘Venice of the North’ on a full-day, visa-free city tour, with an expert guide. After a panoramic drive, visit the Peter and Paul Fortress, built to defend the young city from Swedish attack. 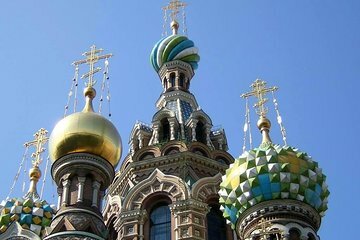 Admire the Church of the Savior on Spilled Blood, ride a boat along the canals and explore the Hermitage, one of the world’s premier museums, and home to paintings by Da Vinci and Rembrandt. Numbers are limited to 15 for a small-group experience. Ended up being the only people on the tour. Guide and driver were very attentive and knowledgeable. Great overview of the city. Only downside was the audio on the canal tour- the quality was poor and hard to understand. Pünktliche Abholung und Rückfahrt zum Schiff. Sehr nette und kompetente Stadtfuehrerin mit umfangreichen Informationen rund um St. Petersburg. Haben viele tolle Eindrücke erhalten. Würden den Ausflug jederzeit wieder buchen. Waren sehr zufrieden.